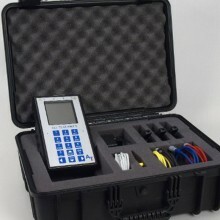 Includes: 3x Test Leads with custom heavy-duty Kelvin Clips and push-pull connectors, 1x Test Lead with 4mm safety plug and MC “Dolphin” clip, Charging adapter, Universal input type 85-260VAC, output 9VDC @ 1.7A, MCA Basic™ Software, hard case with pre-cut foam liner, User manual on CD. 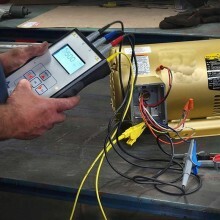 The ALL-TEST Pro 33 IND™ is used to test AC Induction, squirrel-cage rotor motors <1000V for: contamination, winding faults such as turn & coil to coil, open connections, ground faults and evaluates the condition of the rotor. 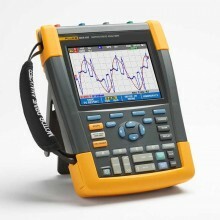 This instrument presents an exciting breakthrough in de-energised testing. Within minutes the operator can get a complete picture of the condition of a motor without having to stress-test the windings or use other more expensive or elaborate instruments, which can be difficult to operate and analyse captured data with. The instrument can be used in two modes: Static and Dynamic. Both quickly collect data in auto mode and there is no need to operate a lot of difficult to understand buttons. THE STATIC TEST can be performed at the control panel and takes only a few minutes per motor! It tests “the whole loop”, i.e. cable, connections and stator/rotor from the starter/motor drive. 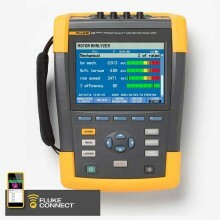 No need to disconnect drives and machinery for the phase to phase test. It reports whether a change has occurred between a prior test (the baseline) and the present test. Use this as an initial test reference as a motor specific parameter value, and to confirm the health of an Induction motor. Subsequent test results can be immediately compared to the reference TVS™ to instantly show developing problems or changes with the stator or squirrel-cage rotor. 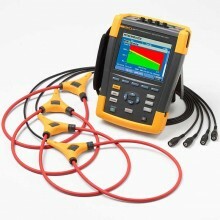 It measures Resistance, Inductance, Impedance, Capacitance and Phase Angle. 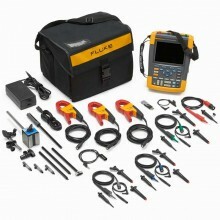 The fault indicator is not dependent on Rotor position. 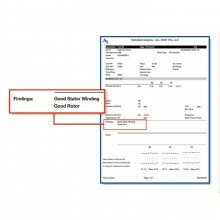 The Static test is compared to a base-line test that can be retrieved from “Reference Value Static” records in the instrument, or from the optional software. Meg-ohm-test with 500 and 1000 V reading up to 999 Mohm is standard. 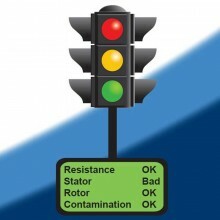 The AT33 IND™ Dynamic Test analyses the results for you by showing Bad, Warning or OK for Resistance, Stator, Rotor and Contamination. It is developed for testing <1000V induction motors with squirrel cage rotor. Test Frequencies 50, 100, 200, 400, 800 Hz. Test Value Static / Reference Value Static 0.01-10000 ±1% (Dimensionless calculated value). 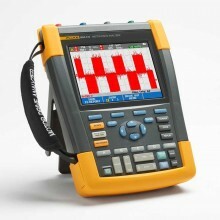 Stator Test Dynamic Repeatability ±1% (of measured data and calculated deviations). Rotor Test Dynamic Repeatability ±2% (of measured data and calculated deviations). True 4-wire Kelvin measurement (Compensation for thermoelectric offset voltages). (This specification is based on battery operation and USB not connected to PC). 1-100 MΩ ±3%, all other values ±5%. Keyboard Sealed tactile touch, XL size keys. Viewing Area = 69 x 36.5mm, white LED backlight. Operating: -10 °C to +50 °C (+14 °F to +122 °F). 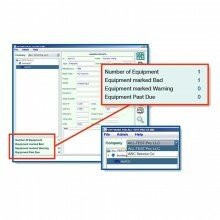 Safety According to IEC 61010-1 cat.III 1000V. Batteries 2 x Li-ION cells with ≥ 2100 mAH capacity. Dimensions 126 x 218 x 51 mm (5”x8.6”x2”) (W x L x H) (basic enclosure size without minor protrusions). Weight 0.7 kg (1.55 lb.). 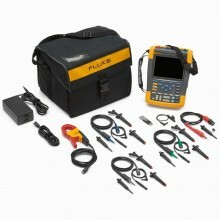 ALL-TEST Pro 33 IND™ warranty 1 year limited warranty; Optional 2 years available with calibration. 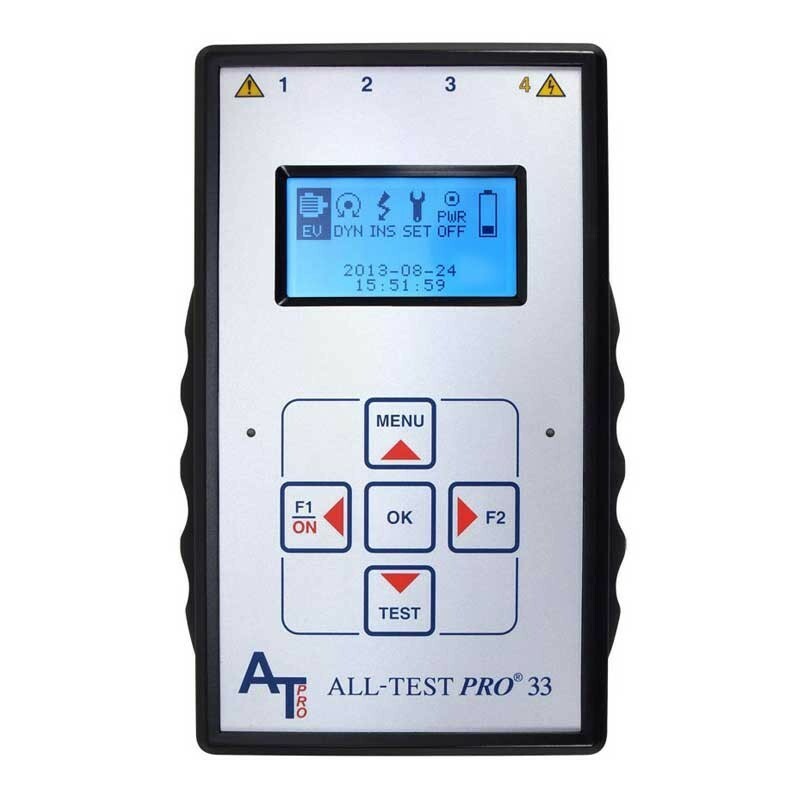 PDF Specifications of the ALL-Test Pro 33 IND Motor Tester.